The versatility of Dexmet precision expanded metals & expanded plastics make it a perfect choice for industrial and automotive products. The Industrial & Automotive Market Segment comprises of a number of industrial applications utilizing Dexmet's expanding technology. Within filtration systems, Dexmet's expanding technology can produce pore sizes to achieve particle filtration, specific flow rates and pressure drops to specifications. 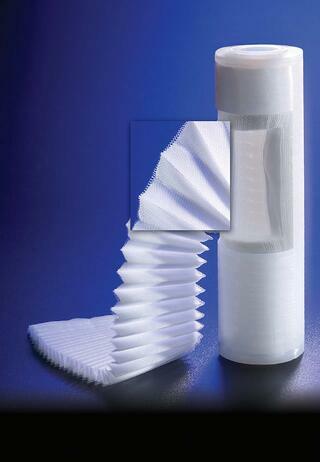 Primarily used as a pre-filter or a filter support material in pleated filters, flow rates typically are minimally affected compared to woven mesh when using Dexmet's proprietary DDB PolyGrid®. Dexmet specializes in expanding products from high temperature fluoropolymers (PTFE, PFA, FEP), offering materials free of harmful chemical Perfluorooctanoic Acid ("PFOA" or "C8") which is found in competing extruded and woven mesh. Dexmet's ultra-thin material process capability also allows filter manufacturers to increase the pleat density 25%, enabling filter designers a competitive advantage traditionally manufactured filters. The Company also produces a wide range of stainless steel products for primary filtration for several customers in various fluid and gas filtration markets. Primary automotive markets include oil-less bushings, high temperature gaskets, heat shields, catalytic converters, fuel filters, inlet screens and speaker grills. Low friction, oil-less bushings are continually being placed in every moving part replacing the need for grease and lubrication points. As new platforms of vehicles are introduced, more of these greaseless bushings are being introduced. Some of the newer platforms vehicles have quantities exceeding 200. The primary material is phosphor bronze, which by chemistry is a lubricating metal, but stainless steel and aluminum are also commonly used in harsh environments or light duty respectively. High performance gaskets are also utilize expanded stainless and low-carbon steel to increase the structural support of high temperature gaskets used for head and exhaust gaskets. 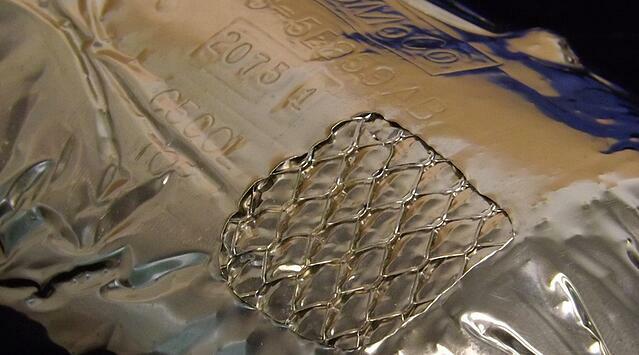 Dexmet's expanded foil materials offer both EMI and RFI frequency shielding protection as well. Common applications are flat ribbon cable used in computer electronics and telecom applications, panel gaskets, electronic enclosures and various portable devices. Dexmet offers fine mesh MicroGrid® to these markets typically manufactured from copper, aluminum, nickel and monel™. Dexmet precision expanded metals & expanded plastics are used in a host of primary, secondary and aftermarket automotive products. Typical applications include low-cost bearings, airbags, air filters, and oil filters. Also, expanded metals and plastics are ideal for inlet air screens, speaker grills & covers, protective mesh and decorative applications. Automotive engineers continue to adapt Dexmet MicroGrid® expanded metals and Polygrid® expanded polymers in innovative ways. Separation and purification are key criteria for industries that process water, food & beverages, chemicals, and pharmaceuticals. Dexmet custom manufactures all MicroGrid® and PFOA-free PolyGrid® materials in a multitude of open area configurations with controlled pore sizes to provide a more consistent flow rate for your filter application. Dexmet Corporation introduces PFOA-Free PolyGrid® Expanded Fluoropolymers. PFOA (Perfluorooctanoic Acid), widely used as a polymerization surfactant in making fluoropolymers including PTFE, PFA and FEP, has fallen under scrutiny by the EPA and FDA for its potential toxicity and widespread presence in the environment and human population. Filter designers now have a solution to remove this harmful additive from their current or new filter designs that utilize PTFE, PFA, and FEP with a PFOA-free expanded material from Dexmet. 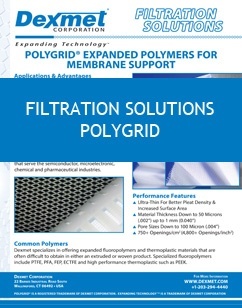 PFOA-Free expanded PolyGrid® is also excellent for applications in the medical, filtration and separation, food processing and food packaging industry. Explore the configurations and possibilities of implementing a PFOA free Dexmet material into your next generation filter. 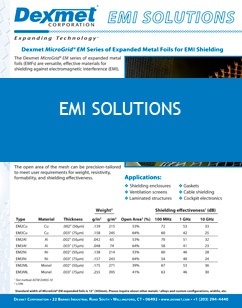 The Dexmet MicroGrid® EM series of expanded metal foils (EMFs) are versatile, effective materials for shielding against electromagnetic interference (EMI). They are electrically continuous and, unlike knit or woven meshes, exhibit consistent and predictable conductivity. Thin, strong, flexible and lightweight, open area products, EMFs will not fray or unravel, and conform readily to complex surfaces, making them well-suited to composite manufacturing processes. 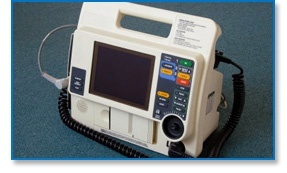 Protecting electronics from harmful interference is essential for critical applications. This data sheet will help you choose the open-area material with the needed attenuation. Dexmet supplies expanded metal foils and polymers for over 100 different industrial applications. 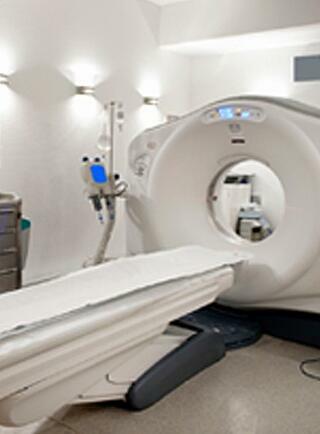 From medical equipment to decorative enclosures, expanded materials can be manipulated for almost any application. The versatility of our open-area products makes it easy to dial in specific characteristics when designing a new product. Have a tough Industrial or Automotive Application? With 70 years of application experience, let us help you work through your needs. Contact one of our application experts and start the conversation!